New York City subway vandal Mona Eltahawy isn’t the only unhinged progressive who believes in a constitutional right to deface property. Conservatives are reporting that their Romney/Ryan bumper stickers and yard signs are being stolen and vandalized by people spitting in the face of free speech. Someone stole our Romney/Ryan sign? Not that something like that would ever happen, right libs? These thieves and vandals aren’t just skulking away into the night. Many are taking to Twitter to brag about swiping and defacing signs, including one guy who used a Romney sign like Occupiers use cop cars. I ripped this dudes Mitt Romney sign outta his yard & ripped it in half.. #FuckYourRomneySignBitch! Keep it up, guys! 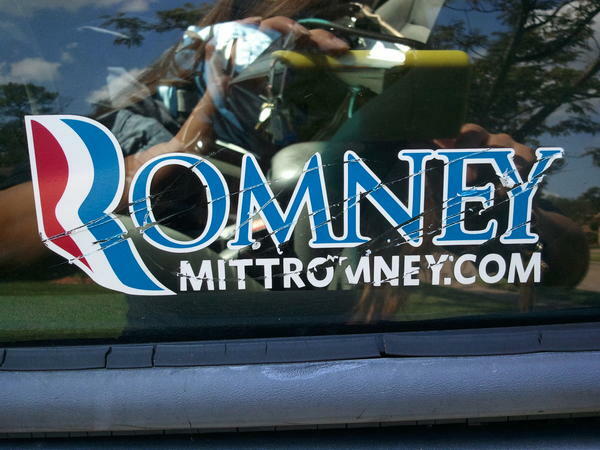 The Romney campaign gets more cash when people have to replace their stolen and vandalized stickers and signs. Other lefty Twitter users haven’t admitted to ripping up signs, defacing stickers and keying cars … yet. As of now, they’re just aspiring vandals. Because that’s persuasive. Saw someone with a Romney sticker on their car and seriously considered keying it. I saw someone with a Romney sticker on their car today , I wanted to throw a rock at there window .. Some Romney haters are hoping people with Romney signs and anti-Obama stickers will do their dirty work for them … by dying. Liberal tolerance on display once again.